After the Moxon excursion, I'm back to dovetailing. There was a Schwarz review of the Knew Concepts fretsaw, which more importantly linked an older post comparing coping and fretsaws for cutting out dovetail waste. There was an important tip on technique in the old post. Chris would cut down from the top of the tail waste diagonally to the opposite corner. Then he'd take a second cut across. 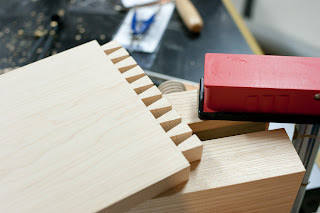 So new tip in mind, I set out on another set of dovetails. This leads to a minor issue with the Moxon vise, which isn't unique to this vise design, but rather is new to someone not having used many (read any) face vises prior. If the work piece doesn't extend below the centerline of the vise face, the vise will rack like crazy. So my small scraps of maple have been set aside for a much larger "scrap of maple. Of course this also results in a much greater number of tails. This turned out to be good and bad. Lots of tails means lots of practice. Lots of tails also means not getting to the pins in the same night. I won't lie, my hands started getting sore using the coping saw. 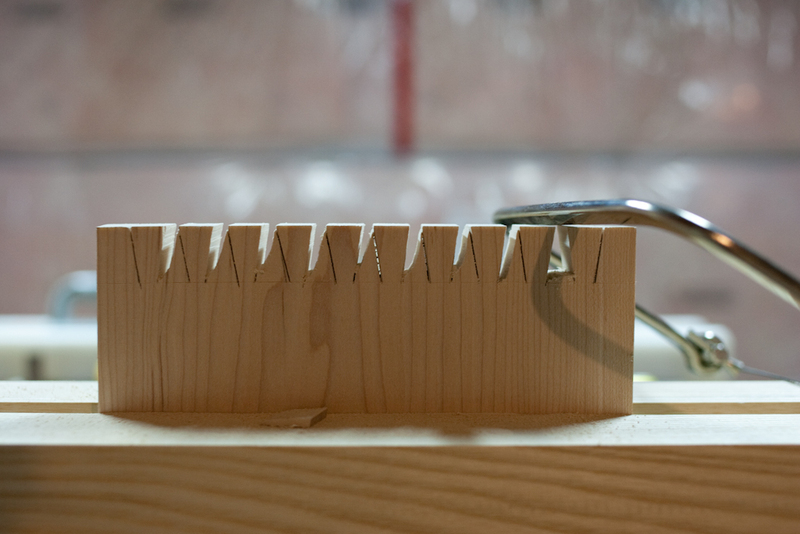 On the second set of cuts, I started using two hands, kind of like a miniature bowsaw, that helped matters greatly. So below is the result. It's not pretty. There's a couple cuts that dipped below the baseline. The chisel work needs work, and likely a touch up of the edge. The board is a bit long to fit lengthwise in the vise, so sawing off the end waste was a bit unstable. Lastly, I need to do a better job controlling the far edge of the coping saw on the waste cuts. There are quite a few errant cuts on the tails. Still, it is only the 7th set of tails. We'll see how the 6th set of pins go tomorrow.